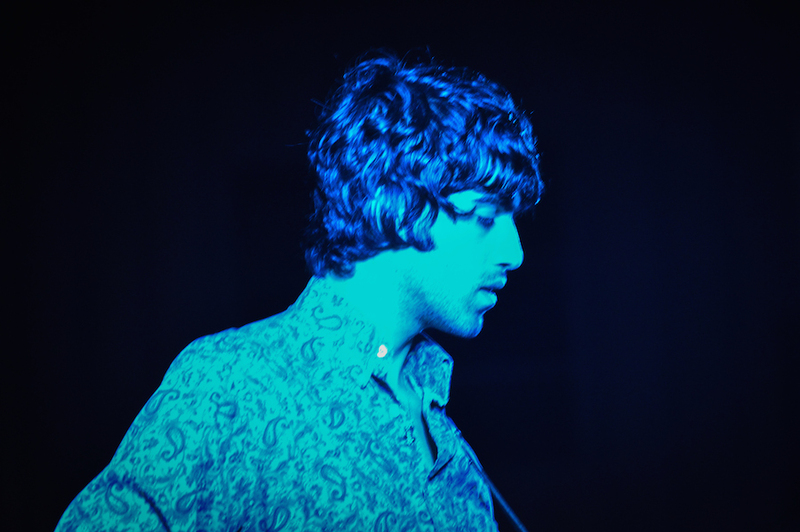 Allah-Las guitarist Pedrum Siadatian. Photos by Brian Addison. The kickoff to the much-anticipated Summer and Music (S.A.M.) 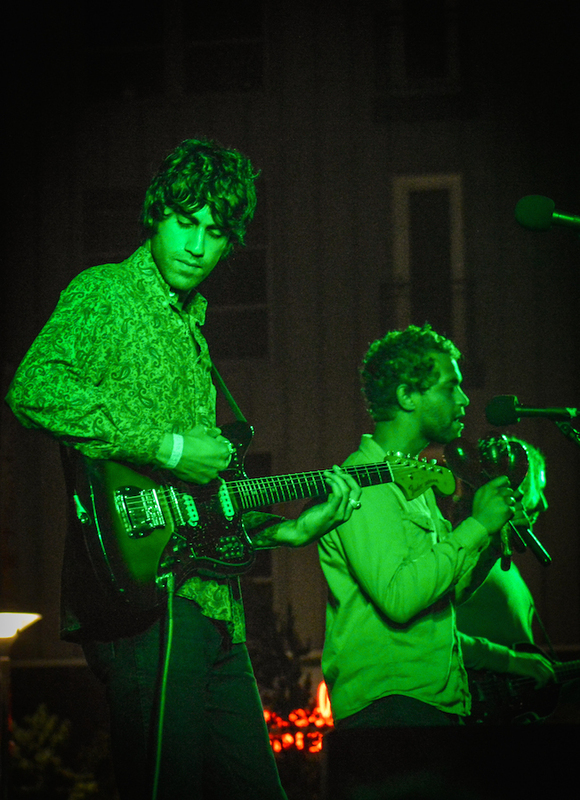 began this weekend with Los Angeles-based surfer-gone-psychedelic band the Allah-Las headlining for Dancin’ in the Streets, held at the Promenade this past Saturday. To say that the band wears its influences on its sleeve is an understatement: from the Beach Boys to the early Stones to some of The Kinks, the Allah-Las bring the greatness of 60s California surf rock to a chilled out, vibrant form. Their sound—surely to be called reductive by Madonna while I would prefer to say they own their influences unapologetically: a reflection of a reflection—is led by frontman Miles Michaud, whose pitch-perfect control captivated the crowd of hundreds just as easily as he captivated the small crowd that gathered for the band’s show at Fingerprints back in April. Backed by guitarist Pedrum Siadatian, bassist Spencer Dunham and drummer Matt Correia, whose charisma shines through when he comes to the front of the stage with a pair of maracas or a tambourine. Dancin’ in the Streets has always had an old-school vibe to it ever since Nick Waterhouse (who shares a label with the Allah-Las) took hold of a Long Beach parking lot with his blue-eyed soul. Last year’s version of the event brought Matt Costa. But the Allah-Las brought a different vibe (and crowd by way of their LA following) that encouraged one to dance in a chill, trance-like mode more than get down to the jungle boogie to the point of sweating bullets. Take “No Voodoo,” from their self-titled debut from last year, for example: the Byrds-like jangly guitar trappings of Siadatian can easily hypnotize to the point of being catatonic but when paired with the alternating percussion stylings of Correia, you can’t help but sway them hips. It’s a rollicking garage rock flashback whose vocal harmonies are impossible to resist as the twangy frosting on the cake. “Don’t You Forget It,” released in 2012 as a split-side with Waterhouse, is nothing short of a bonafide stoner jam that could be easily mistaken for Kasabian were the track not unabashed in fully diving into its influences (with the latter seeming to avoid pure imitation in favor of pseudo-psych). While I lean towards the R&B accoutrements of Waterhouse’s version of “Forget,” there is no denying that the Allah-Las ability to create genuinely mysterious music gives their take on the track a particularly special aspect. However you take the Allah-Las—too self-aware? Or brilliantly adept at capturing a time gone?—there is one thing for sure: if this is their first formal offering (despite having been together since 2008), there’s hope after all that we won’t drown in the massacre of EDM currently happening in anything associated with the word “dance.” You’re left, admittedly, wanting a bit more from the Allah-las but therein lies the aforementioned hope. More Allah-Las and more dancin’ in the streets. The next S.A.M. event will be on July 11 with Twisted at the Pike, featuring Fartbarf, Allah-Las label mate DeLux, and Long Beach favorites Wild Pack of Canaries and Free Moral Agents.